A bit of a grudge match, this one. Dallas Peak is considered the hardest of Colorado's highest 100 peaks (aka, the Centennials) by it's easiest route, in this case, class 5.3. I had failed a year earlier due to inadequate research and had been itching to give it another try. With Steve & Eric taking a rest day, I made plans for an early start. Instead of starting from town as I did on that first effort, I used the Mill Creek Rd. to shave some miles and elevation off. It made for an outing of nearly 8hrs, but all great fun. I was up at 4a and starting from the Mill Creek TH forty minutes later. Half of the road is negotiable by any vehicle, the upper portion more suited for high-clearance. I spent more than an hour by headlamp, the first mile to reach the Deep Creek Trail and the second to reach the junction with the Sneffels Highline Trail. 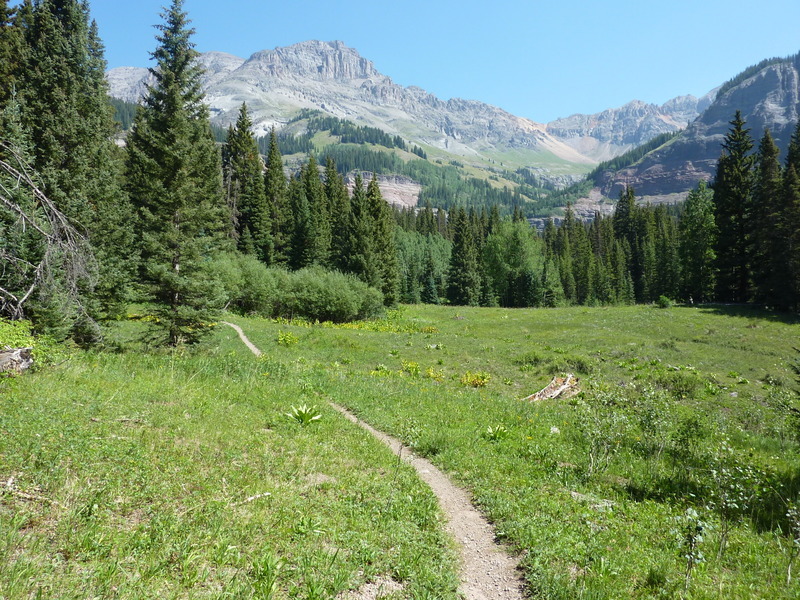 The latter climbs high into Mill Creek Basin, traversing below Dallas Peak across its southern slopes, eventually climbing to over 12,000ft at a saddle before dropping into Pack Basin. It got light out before 6a, well before I was done with the trail. After the second hour I had reached the turnoff at 11,400ft, almost due south of the summit. There's no obvious duck or cairn or use trail to mark the turnoff, as far as I could tell. One simply wanders up steep grass slopes, eventually finding ducks as the grass gives way to unpleasant scree and choss-covered rock. There's no great loss if one doesn't find the ducks initially, as long as you realize you have to move right when high cliffs are encountered. I did a better job of following them on the way down than the way up, your mileage may vary. There's a prominent cairn on the southeast shoulder, marking the transistion from the south to the east side of the mountain. It took about 3hrs to reach this point at around 13,100ft. A good use trail, well-marked by ducks, then continues up the east side to the crest before turning WSW to climb up towards the summit pinnacles. There are two large pinnacles that are fairly obvious as one approaches the upper reaches of the peak. The route goes to the right of these pinnacles. There is some class 3-4 scrambling before reaching the pinnacles, about 40-50ft up to where some rap slings can be found. Once the pinnacles are reached, it becomes clear that there are two smaller pinnacles to the right of the larger two. Between the large and small pinnacles is a gully that leads to a large hole that is impossible to climb. This is the rappel route coming down. Between the two smaller pinnacles is another gully, class 4, leading up to the north side of the summit. I climbed this easily enough by turning around to use some footwork to crawl out of the initial narrow gap. Once at the top of the gully, the North Face is visible with various options. This was further than I'd gotten before and required some careful assessment to find the class 5.3 way up. The first crack I looked at on the north side seemed harder than class 5.3, but it seemed to match the picture I'd seen the evening before (in retrospect, it doesn't match and is much harder). I noted a downward sloping ledge going around to the right with lots of traffic and decided to see if there was something easier around that way. There was. It was a mix of crack and face climbing, a bit spicy and felt like class 4, but short, only about 15ft (this more closely matched the pictures I'd seen). Above this is more class 3 scrambling, seemingly ending in cliffs but nicely working out to weave through large blocks and get one to the summit. It was almost 8:30a when I topped out, having taken the better part of four hours. There was a good deal of smoke blowing in from the west and obscuring views, even of Sneffels, only 2mi to the northeast. A register (dry, surprisingly) dated to 2015 and had quite a few entries, the most recent only 4 days earlier. I could see a rappel sling around a rock to the east and went over to check it out. The drop goes nearly vertical down to a ledge above the chockstone hole. When I tossed the rope, it didn't quite reach down to the bottom but it seemed "good enough." I was surprised to find the rappel went free-hanging after the first 10ft, all the way to the bottom. I pulled the rope and passed it through the lower rap sling, then dropped into the hole less than half the rope length to the sandy bottom. The hard snow that had partially filled the gully a year ago was almost completely absent, just a small sliver still hiding near the top of the gully where it is shaded year-round. I packed away my gear, took a few gulps of Gatorade, and started down. The excitement abated, I spent the next 2.5hrs reversing the 5mi route back down the mountain. I paid better attention to the ducks once I was back on the south side. They seemed to mark an easier route than the somewhat random one I had ascended. I enjoyed hiking back on the trail, running into only two other parties by the time I returned just before 11:30a. A highly enjoyable day!